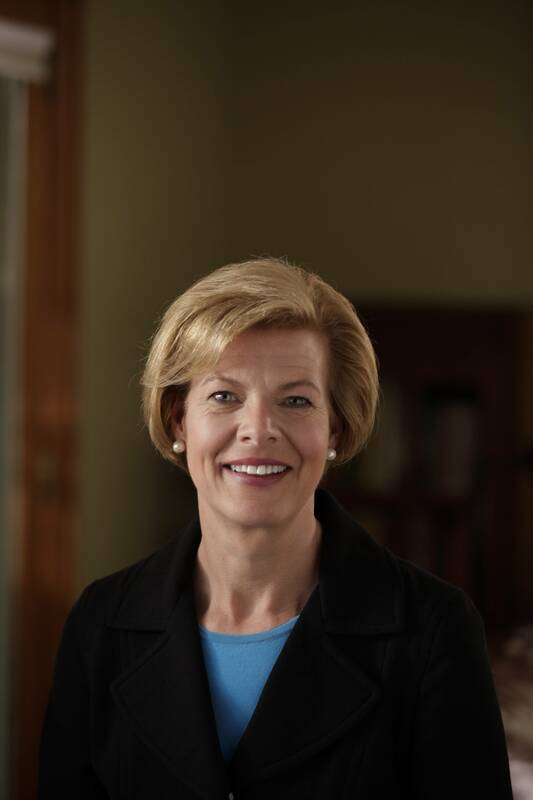 Tammy Baldwin was born in Madison, Wisconsin. She was raised by her grandfather, a biochemist at the University of Wisconsin, and her Nana, a talented seamstress and head costume designer in the UW Theater Department. When Tammy was nine years old, she came down with a serious illness similar to spinal meningitis. She spent three months in the hospital. But even after she got better, she was labeled as a child with a “pre-existing condition” making it nearly nearly impossible for her grandparents to find her any insurance, at any price. Tammy took these lessons to heart and championed important reforms in the Affordable Care Act. Her push to allow kids to stay on their parents’ insurance plans until they are 26 years old has helped cover millions of young Americans. Her leadership in protecting people with illnesses has made sure no one is denied care because of a pre-existing condition. Tammy was raised by her grandparents because her mother struggled with mental illness, chronic pain, and drug abuse. Tammy had to grow-up fast as her mother struggled with addiction to prescription drugs her entire life. So when the opioid epidemic spread across Wisconsin, devastating countless families and entire communities, Tammy worked to make sure Washington finally stepped-up and supported local prevention, treatment and recovery efforts in Wisconsin. As her Nana grew older, Tammy served as her primary caregiver, a challenging but deeply rewarding experience. She saw firsthand the importance of strengthening and protecting Wisconsinites’ earned benefits of Medicare and Social Security. And as a Senator, Tammy worked across party lines to pass bipartisan legislation into law to support family caregivers across America. Tammy attended public schools in Madison, graduating from Madison West High School and went on to Smith College to double-major in government and mathematics. After graduation, she worked on pay equity issues in the Wisconsin governor’s office before beginning her studies at the University of Wisconsin Law School. During her second semester of law school, Tammy was elected to the Dane County Board of Supervisors where she served four terms. During her tenure she made the most of her position, chairing the Dane County Task Force on AIDS at the outset of the epidemic. Then, after serving on the Madison Common Council to fill an aldermanic vacancy, Tammy was elected in 1992 to represent Wisconsin’s 78th District in the Wisconsin State Assembly. Following encouragement from friends, family and neighbors, Tammy decided to run for the U.S. House of Representatives. It wasn’t an easy race. Many powerful people said it wasn’t Tammy’s turn. They told her voters weren’t ready. But Tammy pushed forward — and in 1998, with a scrappy grassroots campaign, she was elected to Congress. Tammy became Wisconsin’s first female member of Congress and America’s first openly-gay non-incumbent elected to Congress. Tammy got to work, and in addition to leading the health care reforms that allow Wisconsinites to stay on their parents’ health insurance until age 26 and protect people with pre-existing conditions, she distinguished herself as a fierce defender of working families in Wisconsin. She led efforts against the unfair trade deals that are responsible for shipping American jobs overseas and holding back wage growth for Wisconsinites. Tammy was one of only a handful of votes against repealing the Glass Steagall Act, which separated risky investment banking from traditional banking. That repeal has repeatedly been pointed out as a driving force behind the 2008 financial crisis. In the House, Tammy worked across party lines to build consensus around bipartisan legislation to help Wisconsinites. Her bill to help our blinded veterans, the Dr. James Allen Veteran Vision Equity Act, passed the House and Senate with overwhelming support from Republicans and Democrats alike. And she worked hard to make sure her women’s health legislation to expand access to breast cancer and cervical cancer screenings was signed into law by a Republican White House. In 2012, Tammy Baldwin ran for Senate and Wisconsin made history again. Tammy became the first woman Wisconsin sent to the Senate and the first openly LGBTQ Senator in history. In the Senate, Tammy is putting Wisconsin first and doing right by working families across the state. People know that Tammy will sit down with anyone, no matter their party, and she’ll take on anyone, no matter how powerful, if it means getting the job done for Wisconsinites. Tammy is building a stronger Made in Wisconsin manufacturing economy by championing Buy American rules, confronting unfair trade deals, and helping create good-paying Wisconsin jobs. She is working across party lines to make sure our veterans are supported with the health care, jobs, and community support that they have earned and deserve. And when some in Washington pushed partisan repeal efforts that would have ripped health care away from millions of Americans, Tammy led the fight to protect our health care. Tammy is not letting up and she’s continuing to push for affordable health care for every Wisconsinite and bipartisan action to address the opioid epidemic. Special interests want Washington to keep working for them, not Wisconsin. As a Senator, Tammy has stood up to the powerful and wealthy who want to keep the system rigged in their favor by holding Wall Street accountable and taking on big pharmaceutical corporations that jack-up the prices of prescription drugs. So it’s no surprise that this year, corporate interests, billionaire megadonors, and shady Super PACs have made Tammy a top priority and have flooded Wisconsin with millions in outside spending against her. But no matter how much secret money these special interests spend, Tammy will continue doing right by Wisconsinites and work to reduce the influence of special interest money in our government and our elections. Tammy currently serves on the Senate Appropriations Committee, the Senate Health, Education, Labor and Pensions (HELP) Committee, and the Senate Commerce, Science, and Transportation Committee. For more on Tammy’s record of putting Wisconsin first, click here. See more photos of Tammy around Wisconsin in 2018.